How concerned should we be about consistency? The answer if you were George Orwell would seem to be not very much. Orwell was, to use one of his own phrases, a “change-of-heart man.” So in the 1930s he held the view that fascism and capitalist democracy were flipsides of the same coin, but by 1940, he had dismissed such views as deeply irresponsible. He was on the side of pacifism in the late 1930s, but in the 1940s he felt that to be a pacifist was to be on the side of Hitler. He placed a famously large premium on truth, though he also felt that lies were justifiable for political ends (as his diaries make clear, he was certainly prepared to spread false information for the BBC during the Second World War). If this was hypocritical, then even his views on hypocrisy were two-faced: it was politically benign, but it was also vicious. So Orwell was liable to give two fingers to consistency. He was a walking paradox of the Left who believed that “to defend Socialism it is necessary to start by attacking it.” He was a disciple of brotherhood who recoiled from a good cross section of his brothers (“the sandal-wearers and fruit-juice drinkers who come flocking towards the smell of progress like bluebottles to a dead cat”). He was a socialist egalitarian who denounced “the personal inferiority of many individual Socialists.” He was a revolutionary and an internationalist who insisted that no ‘real revolutionary has ever been an internationalist.’ He was an intellectual who loathed intellectuals. “To accept an orthodoxy,” Orwell believed, “is always to inherit unresolved contradictions,” but to oppose orthodoxies for heresy’s sake – as Orwell did – was also to generate them. So he became a utopian when surrounded by realists and a realist when confronting utopians. In the face of other people’s windy moralism, he could sound like an economic determinist, but against the fatalism of certain nay-sayers he stressed the importance of moral effort. 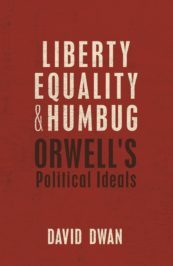 It’s easy to take a dim view of Orwell’s inconsistencies, seeing them as signs of obtuseness, sloppiness, arrogance, or opportunism – vices that were expressed and disguised by a relentless air of certitude. Yet Orwell’s shifts and pivots raise broader questions about how much consistency we can reasonably demand in moral and political life. His belief in certain ideals – namely, liberty, equality and fraternity – gave a certain coherence to his politics, but they also supplied them with their element of contradiction. While this trinity of values might entail each other (in Orwell’s eyes, they provided socialism with its basic, ethical co-ordinates), they could also conflict and they frequently do so across his writings. So liberty might need equality if it is to be enjoyed by all (Orwell does a good job showing why), but the installment of this equality through state intervention can erode minimalist ideas of freedom. Orwell’s commitment to such liberty made him speak of the “nightmare of state intervention.” At other moments, however, Orwell sided with equality even if it threatened to involve a type of serfdom. Elsewhere Orwell’s fundamentalism about freedom could make even brotherhood seem deeply coercive (indeed, the very word comrade seemed to trigger allergies in Orwell). Yet in 1943 he championed brotherhood over happiness itself. The fact that one might have to choose between them was itself deeply revealing. Throughout his life Orwell struggled to answer the question that faces all moderns: “Which of the warring gods should we serve?” Like most of us, Orwell ended up serving different masters at the same time. This could make his politics look like a mess. But it was also a noble mess – the result of a principled refusal to throw over the basic values that justice should serve, even if they were liable to culminate in confusion. So a commitment to justice and charity made him want to kill fascists in Spain; an appeal to the same principles also accounts for his refusal to kill them – at least when their trousers were down (see his reflections on this matter in “Looking Back on the Spanish War”). This may seem inconsistent, but moral clarity has often proved to be pretty brutal in what it is prepared to set aside. Orwell loathed the ways in which intellectuals were often willing to relinquish their moral intuitions and messier feelings in the name of theoretical consistency. On the other hand, Orwell was happy to embrace the mess even if it yielded conflicting views of what was right. And yet he couldn’t let it rest there. After all, his writings repeatedly stress the virtues of consistency and emphasise the political and existential dangers of its abandonment. He was an excoriating critic of collective “schizophrenia” and “doublethink” and showed how the abandonment of reason’s laws leads to collective servitude. As Winston Smith declares in Nineteen Eighty-Four: “Freedom is the freedom to say that two plus two make four. If that is granted, all else follows.” What Orwell appears to defend here is not simply freedom of speech, but the idea of consistency itself: without some commitment to this principle we stop making sense to ourselves and the world fails to make sense. We thus lose rational control over our lives, and cease to be free on any meaningful level. Perhaps it is fitting that on the question of consistency itself Orwell was once again inconsistent. Featured image credit: “Brick” by werner22brigitte. CC0 via Pixabay. David Dwan is Associate Professor in English at Hertford College, Oxford. He writes on the relationship between literature and intellectual history, particularly moral and political philosophy, from the late eighteenth- to the early twentieth century. Is this ‘inconsistency’ no more than the recognition that moral goods are not always compatible? I don’t know if Orwell states this explicitly anywhere, but his intelligence and experience would have led him to recognise it. Is it too simplistic to think that is explained by the yin and yang of a personality, I believe we have a duality within us be that man/woman, liberal/conservative, adult/child and we need this duality of opposites to create the rounded person.